The 2015 film, ‘Everest’, captures the staggering boldness of Rob Hall. His jaw-dropping five-time summit of Everest was already a record-breaking achievement, but when he attempted to reach the peak of the world’s biggest mountain for the sixth time, it was to be his last. The real story of Rob Hall’s life and death is as astounding as the film. A tale that leaves us questioning the very act of climbing Everest. We like to think that we can conquer nature and outsmart extremes, but every now and then, we have a chilling reminder of the fragility of human life. Hold on to your seats for an unnerving, heart-stopping true story of man versus nature, in one of Everest’s most deadly tragedies. Rob Hall was a record-breaking climber. He had climbed Everest so many times, that he had made a business out of it. His climbing company, Adventure Consultants, was founded in 1991 by Rob and his friend Gary Ball. Adventure Consultants offered climbing expeditions to people from all over the world. 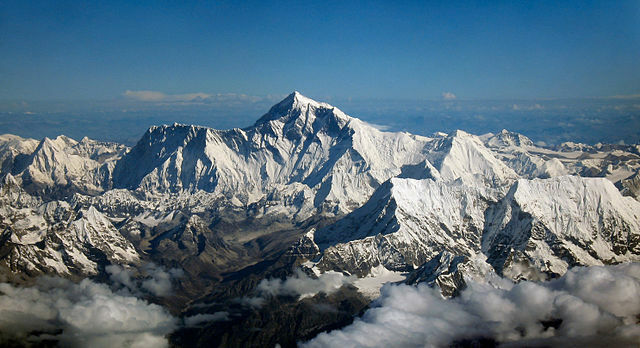 The tours available included climbing Mount Everest for around $65,000. The business was a new concept at the time of its inception and Adventure Consultants was a controversial idea. Both Rob Hall and Gary Ball were experienced climbers who completed 47 expeditions together – an incredible achievement. 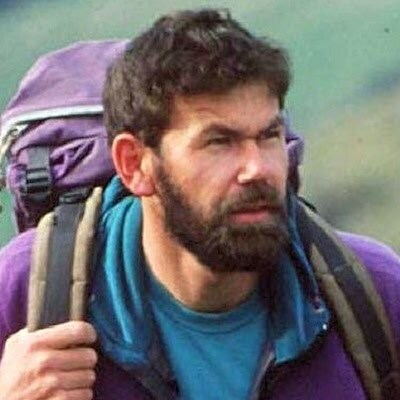 However, in 1993, Gary Ball died from HAPE (High-Altitude Pulmonary Edema), a deadly high-altitude condition that causes fluid to collect in the lungs. Gary and Rob were on Dhaulagiri in Nepal, the seventh highest mountain in the world. Gary died in Rob’s arms. Rob continued the business, which still runs climbing tours to Mount Everest today. Adventure Consultants is now owned by Guy Cotter, who bought the business after Rob’s death. Born in New Zealand, Rob Hall was destined for adventure. His love for climbing began with New Zealand’s famous mountain range, The Southern Alps, which were close to where he lived. Having talked his way into a job designing outdoor gear at fourteen, Hall’s passion for climbing was sealed when he scaled Ama Dablam, his first Himalayan mountain, at the age of nineteen. Hall continued to climb, combining his passion with working as a guide for the New Zealand Antarctic Research Programme. In 1990, he reached the summit of Mount Everest for the first time with his buddy, Gary Ball. Hall went on to scale Everest a death-defying total of five times. More times than anyone else (except the native Sherpas). Rob Hall conquered mountains all over the world, but the Himalayas continued to pull him back. He once scaled five of the world’s six tallest mountains in fourteen months. Responsible for a number of risky rescues of other climbers in danger, Hall was respected by adventurers all over the globe. A famed explorer back in New Zealand, he was nicknamed “the mountain goat” for his climbing skills. However, upon his sixth ascent of Everest, he was stranded and his own dance with the mountain’s deadly conditions would soon be over. In 1996, Hall made his last ascent up Mount Everest with a party of eight paying clients. This would be his final Adventure Consultants tour. Two guides, Mike Groom and Andy Harris also joined the expedition. It was the 10th of May, 1996. As the group began their final quest for the summit from Camp IV, they were joined by three other parties, Scott Fischer’s Mountain Madness, a group from Taiwan and another from India. 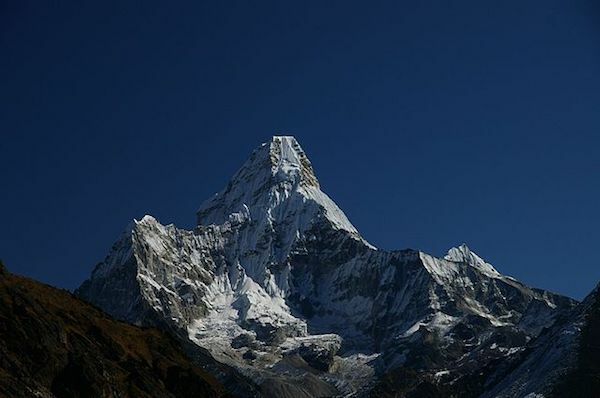 The number of trekkers who were present on that day is an issue in itself for those that want to see the mountain rid of tourism-style climbing companies. Months before, Jan Arnold, (Hall’s wife) had had to cancel her plans to join the tour when she discovered she was pregnant. Jan was an avid climber too and had conquered Everest with Hall in 1993. As the combined group attempted to reach the summit, they encountered a series of problems. Forced to wait for an hour on the Hilary Step after they realized that there was no fixed rope (known as a fixed line) to use, things began to go seriously wrong. With a large number of climbers on the move at the same time, and the many minutes spent laying new ropes, the tight scheduling for the climb began to slip. An hour behind, there were now too many climbers for everyone to make it to the summit by the planned time of 2 p.m. Reaching the summit by 2 p.m. ensured that there was enough time to make it back to the camp before it got dark. At 3 p.m., with climbers still climbing below, the Sherpas who had been waiting at the top of Everest began their descent. When the Sherpas (who included Ang Dorje Sherpa), came across Doug Hansen from Hall’s party, he refused to listen to the Sherpas and return to the camp with them. By the time Hall arrived, Hansen’s extra oxygen had run out, they had been on the mountain an hour longer than planned. Although he knew that it could prove fatal, Hall made the brave decision to stay with Hanson who was dwindling fast. He instructed the Sherpas to continue their descent and help the other climbers back to the camp. At 5 p.m. one of the most deadly blizzards in climbing history hit the summit and Hansen was now unconscious. Hall radioed the camp for help. 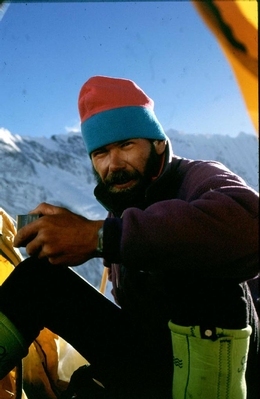 Andy Harris, his colleague began the treacherous climb to bring crucial oxygen and water to Hansen and Hall. Harris got the supplies to Hall, but he never made it back to camp, Hansen died later that night too. At 4.43 a.m. Hall radioed camp again. This time it was Rob Hall who was in trouble. He was on the South Summit but his oxygen regulator was iced over and he couldn’t get it to work. He could not use his vital oxygen supply. Five hours later, he had managed to get the oxygen working, but the elements had begun to win his battle against the cold. His hands and feet had succumbed to frostbite. He could no longer navigate the ropes – his time was almost up. In the afternoon, he contacted Base Camp with his dying request, one last precious conversation with his wife Jan Arnold via satellite telephone. Over the radio, his final words to his wife were: ‘Sleep well, my sweetheart. Please don’t worry too much’. In total, twelve climbers died on Everest that day, including Rob Hall and Scott Fischer. For those of us who are mountaineering novices, it will surprise you to know that Rob Hall’s body still lies on Mount Everest. Where does Rob Hall’s body lie on Mount Everest? Good question – but a complex one when it comes to climbing Mount Everest. Where is Rob Hall’s body on Mount Everest? There are over 200 dead bodies on Everest. It is said that climbers enter another zone when they reach the deadly heights of the uppermost reaches of Everest, passing bodies, frozen solid in the snow. Most fatalities are caused by avalanches or falling. With each step costing three to five breaths of oxygen, conditions near the top are too dangerous to retrieve bodies. There is not enough oxygen at that altitude to bring the bodies down from the mountain. The code of the mountain is one of survival. If someone is not going to make it, you have to save yourself and move on. Frozen solid, there is a serious danger in attempting to chisel away the ice to even move these rock hard corpses to a more discreet location. 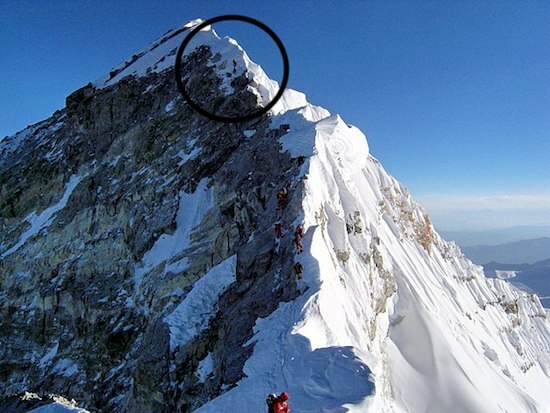 Sherpas have died trying to do this at the request of bereaved loved ones. Eventually, the bodies will fall away naturally, down the sides of the mountain, to a more private resting place. Rob Hall’s body still lies along the South Summit. Two months after Rob died, Jan gave birth to Sarah – a name they had both picked out together. Sarah Arnold-Hall and Jan still live in New Zealand. Jan remarried in 2002 and had another daughter with her second husband, Andreas Niemann. There are many other stories of both death and miracles from the treacherous blizzard on Everest, on the 10th of May 1996. Jon Krakauer, a journalist, who was one of Rob’s party, published a book of his story called Into Thin Air in 1997. A television film version of the book was also released in 1997, Into Thin Air: Death on Everest. Still suffering Post Traumatic Stress Disorder from his experience, Krakauer regrets ever agreeing to cover Rob Hall’s fatal 1996 climb for Outside magazine. Seaborn Beck Weathers, another survivor from Rob Hall’s party shared his own death-defying escape in his story: Left for Dead: My Journey Home from Everest in 2000. Although Krakauer and Scott Fischer’s wife have been the loudest of numerous critics of the 1995 Everest film, Jan Arnold-Hall gave the film her blessing. Despite the arguments over how supporting characters were portrayed, it is difficult to argue against the film’s success in evoking the sense of thrill, awe and intense danger that makes the challenge of Everest so intoxicating. An intoxication that is sparking much-heated debate about the growing number of humans that are climbing this remarkable mountain, sparking increasing environmental concerns. What did you think of the film Everest? Are climbing companies like Adventure Consultants causing unnecessary harm to Mount Everest? Should humans be attempting to scale the peaks of the Himalayas? We love to hear what you think. Share your thoughts, opinions, and stories below. We hope you enjoyed the latest epic story at Know More Stuff. To be notified when the latest articles go live then be sure to follow us on Facebook. It only takes a second. If you liked this one then we’re sure you’ll enjoy another story that was made into a Hollywood film: the tale of Bufford Pusser.